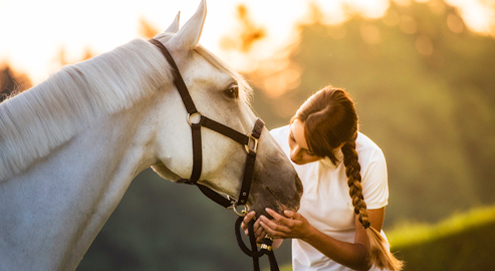 Worm infestations not only occur in cats and dogs, but also in horses. These parasites can cause health problems in horses. That's why it is also important ensure a good worming treatment regime. This worm is most common in horses. The adult worm lives in the horse's large intestine. The larvae can crawl into the intestinal mucous and go into "hibernation" there. At that point, the larvae are impervious to worming treatments. At the end of winter or beginning of spring, these larvae can come out of the intestinal mucous in droves and cause problems such as colic and diarrhoea. These worms are also referred to as red blood worms, since the larvae in the stool can be recognised as small red worms. This worm is no longer common, but can cause serious symptoms. Once ingested, the larvae of this worm species can move all around the body. From the intestinal wall, the larvae move into the blood vessels in the bowel and can do a lot of damage here. Infected horses may have diarrhoea, colic, a dull coat and fever, and often have a poor appetite. As the name suggests, this worm species occurs in foals. The foal is infected by ingesting worm eggs through the mother's milk. The foal will excrete worm eggs, from which larvae develop, which can penetrate the foal's skin and reinfect the animal in this way. Most foals are infested with this worm after birth and at the age of 4 weeks there is often a peak of infection that can cause diarrhoea. It is sensible to give your foal worming treatment between the age of 7-10 days and ensure good stable hygiene in order to prevent re-infestation through the environment. Larvae are ingested by the horse whilst grazing. The adult worm of this species lives in the appendix. Most horses do not show any symptoms of an infestation, but in the event of more severe infestations it can cause serious colic. This worm is difficult to diagnose through an examination of the stool, but it can be found through a blood test. We recommend that horses receive worming treatment at the end of the pasture season, in consultation with your veterinarian. This is the most common worm species in young horses. The worm mainly occurs in foals up to the age of 6 months. The worm eggs are ingested in the pasture and develop into larvae. This larvae travels all around the body. From the intestinal wall, the larvae moves to the liver and the lungs, where it is coughed up and swallowed to end up in the gastrointestinal tract, where the larvae develop into adult worms. The symptoms that this worm can cause include stunted growth, protruding bellies, poor coat condition and poor appetite. Foals can also start coughing and get diarrhoea and colic. This worm species is unfortunately quickly starting to become resistant to Ivermectines. Horse bot flies may not be worms, but they are internal parasites that are often seen in horses, which is why we are discussing them in this article. Horse bot flies lay their eggs, which can be recognised as yellow dots on the horse's coat, mainly on the lower legs. These eggs are licked up by the horse. The larvae end up in the horse's stomach this way. These larvae often stay active for a number of months, and then they end up back in the pasture in the horse's stool. These horse bot flies can damage the stomach and cause the horse to lose weight. There are plenty of worming products available with various active substances. Unfortunately, partly due to them being used incorrectly, parasites have become resistant to certain products. For example, the roundworm is showing signs of resistance against worming products containing Ivermectine. Unfortunately, no new worming products will come onto the market any time soon, so we have to be careful with the available products and ensure that the resistance does not increase further. That is why it is important to restrict the use of worming treatment as much as possible, without risking the health of your horse. It is important to use stool examinations for your veterinarian to advise you on when worming treatment is necessary and what product you should use. Stool examinations can be used to check whether your horse has a worm infestation. When your horse is infested with worms, worm eggs are excreted with the manure, and these are visible when the manure is examined microscopically. The vet not only looks at the worm species that is present, but also at the number of worm eggs. There is no standard worming schedule available. The worming policy is tailored to each horse, according to their living environment and the findings of the stool examination. There are special recommendations for foals, please contact your veterinarian for these. It is important to have stool examinations carried out 2-3 times a year in adult horses, mainly in spring and summer. It is also important ensure a good pasture management and hygiene. Try to move horses to clean parcels of the pasture on a regular basis, remove the manure from the pasture 2x a week, alternate the kinds of animals grazing in the pasture and ensure that stool examinations are carried out (and, if necessary, worming treatment has been administered) before moving the animals to another part of the pasture. Since 1 July 2008, worming products for horses require a prescription and are therefore no longer available over the counter. This is why we cannot sell worming products for horses in our webshop. Working products are now only prescribed after a comprehensive stool examination. The law has changed due to the increasing resistance. Vetsend has various products that can be used preventively. These are natural products that affect the bowel environment of the horse in such a way that the circumstances are as unfavourable for worms as possible. In addition, these herbs contribute to a good general intestinal health. Examples of these types of products include Equi Parex and Verm-X Horse. No prescription is needed for these products. Please note, these products are preventive products only and do not kill the worms like regular worming treatments do. This is why, should you choose to use these products, you need to have a regular examination of the horse's stool. If your horse has a worm infestation, regular worming treatment should be administered (in consultation with your veterinarian). Contributes to healthy intestines and cleanses them.